This week, I'm just starting my winter crochet project. It will be a blanket for the family room. I've made three blankets for that room in the past few years, and I want to make one more so we'll each have one to use. They have been made to replace some old (30+ years) blankets made by my husband's grandmother. He and his brother actually used them on their beds when they were kids. Normally, I treasure old, handmade things, but these blankets have been used to death, quite literally. Whole sections of crochet just come off in handfuls. I think the yarn just gave up from age and use. So I've been making new blankets to replace them, throwing an old one away whenever I finish making a new one. For this blanket, I'm trying a new-to-me technique, the Larksfoot stitch pattern. It's easy but very effective, I think. I've just barely begun, but I'm enjoying it so far. I have lots of worsted acrylic to use up, so I'm going to try to make this blanket from stash yarn only. Ironically, I'm crocheting a winter project while I'm back to reading Bernd Heinrich's Summer World. I got back into this weekend, while I was hanging out on the couch with my new pal, the cold. It's such an interesting book and I like having something sort of light to read while I'm not feeling well. I say "light," but it's actually quite scientific. I guess what I actually mean is that it lacks the murderousness of my usual reading material. I like it, though. I'm getting ahead for homeschool, which is nice, plus with summer actually ending now, it's nice to look back on the good parts of my least-favorite season. Ha. Thanks for all the get-well wishes. I'm feeling a little bit better now, but I think my list of things to do this week was waaaaay too ambitious. Baking a pie, for example. Pssh. Maybe a frozen Marie Callender's pie, but one from scratch? Not gonna happen. I hope you're all doing well; I'm way behind on blogs right now. How you doin' (Joey Tribbiani voice)? Tell me something good. Great to hear you are feeling much better. Greetings and best wishes! I am so glad you are feeling a little better. There is nothing like a new project to get started on particularly a winter projects that warms you through the cool months. I'm trying to find yarn to make my own winter blanket. My daughter has been stealing our couch blanket more and more frequently. I love these colors. I still have the blanket my mom crocheted for us years ago. I just love it. It holds so many great childhood memories. I would agree with you on the pie making, best to save that for when you feel more like it, and for now just enjoy one from the freezer section, they are pretty good! It is a lovely stitch pattern ! I think this will work well for a blanket ! I want to eat a pie, not bake one. I do love a homemade pastry crust though. Your blanket plans sound great. 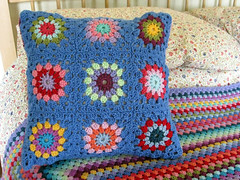 Making a blanket is still somewhere on my "wanna do" list. I hope it happens for me this fall! I like the idea of treasured blankets made by family members too. My mom had one that my great-grandmother had made, and it's still being used now by my sister's family. Simple knit squares from her stash ... I never met my great-grandmother, but I'll bet she was a no-nonsense type gal who knew all you needed to know about knitting, sewing and putting up preserves. Glad to hear you're on the mend, enjoy the rest of your week! A frozen pie? I won't tell if you won't! My Grandma crocheted. I have an Afghan she made for me 36 years ago. Still in great shape! My youngest son likes to crochet of all things. He finds it relaxing. I remember a famous football player back in the day, Rosie Greer, who did it too. Just realized I capitalized afghan. Haha...I suppose that makes it a totally different thing, right? Your crochet blanket looks wonderful. Can't wait to see it unfold. And yes, sometimes it is just the time for replacing the old blankets with new ones. Yours will be very pretty - that stitch looks lovely! I LOVE the colours you started your blanket with. Blankets and shawls are truly my favourite things to make - they always fit!!! Love thwt color! Thanks for sharing. 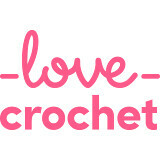 I love the idea of a winter crochet project, such a great way to announce the start of a new season. It's a lovely stitch and I look forward to seeing how it progresses. I'm glad you're feeling a little better - continue to get fully well again, you need all your energy to make the most of autumn. It's going to be a gorgeous blanket. I cross my pinkies..I do love those two colors together. I am inspired to learn that stitch..tho. I am not a very good crocheter. Sending healing vibes and I say a store bought pie is just fine. p.s. What word could be more beautiful than Larksfoot to describe a stitch. This positively make my heart glad. What a lovely stitch - the new blanket is going to be very pretty. I would trade you my dental issues for your cold ... only it would be an unfair trade. Hope you feel better soon! 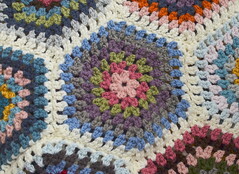 Your new crochet pattern looks lovely....the perfect way to begin the changing of the season too. Hope your cold goes soon. Take care. I'm glad to hear you're feeling much better. The Larksfoot stitch is new to me too and it looks good. I'm planning to start a project with spike stitch soon. Looking forward to it. Hope the rest of your week goes well. Take care. Love Friends! I think there's a Friends quote for every situation. At this precise moment, Olly is watching Wallace and Gromit, and I'm vaguely thinking about doing some ironing. It's all go here! Your new crocheted blanket is looking great already. I'm doing great thanks! Going off for the weekend to a wedding. Glad to read you are feeling a little better - I hope you have a lovely weekend. I do like the colours you are using ... perfect choice I think.